In Jakarta in the late 1960s, a young Barack Obama noticed his stepfather’s great unease and silence about his one-year military service in New Guinea. Lolo Soetoro, his stepfather, did not like to talk about his time there. He did tell young Barack about how leeches got into his boots in New Guinea’s jungles. “They crawled inside your army boots while you’re hiking through the swamps. At night, when you take off your socks, they’re stuck there, fat with blood. You sprinkle salt on them and they die, but you still have to dig them out with a hot knife.” The leeches created a series of indented scars on Lolo’s legs. Lolo was surprised by the question. “Have you?” Obama asked again. Obama didn’t answer the question. Philosophers around the world could devote volumes to that simple question. But as Obama prepares to visit Indonesia in March, some facts are worth pondering. Fact No. 1: Barack Obama, the little boy who used to live in Jakarta, is one of the most powerful men in the world. Obama now lives in the White House, not the little house in Menteng. And he is going to revisit the home of his youth to sign a “strategic partnership” with Indonesia. Fact No. 2: New Guinea is now called Papua. Its western part is legally a part of Indonesia since the controversial UN-approved Act of Free Choice in 1969, in which 1,025 Papuans, hand-picked by Jakarta, voted unanimously to join Indonesia. Papua, to use Lolo’s words, is still the weak man under Indonesian rule. Human rights abuses by Indonesian security forces remain common. Peaceful protesters continue to receive long prison sentences. Papua is off-limits to most independent outside observers. And it remains poor and underdeveloped, despite the fact that it has abundant natural resources, including natural gas, minerals and timber. Papua has the worst poverty in Indonesia, with more than 80 percent of households living below the poverty line. Papua has the biggest HIV problem in the country, with infection rates 15 times the national average. Fact No. 3: Indonesia’s president, Susilo Bambang Yudhoyono, also has a close connection to Papua. Indonesia’s military commander in Papua in the late 1960s was Brig. Gen. Sarwo Edhie Wibowo, who had previously led a bloody military campaign against Indonesian communists in Java. He would later become the father-in-law of a young Army captain named Susilo Bambang Yudhoyono. The human rights situation in Papua remains poor. Human Rights Watch has for many years urged the Indonesian government to stop prosecuting peaceful Papuan protesters. We have asked the government to open Papua to international journalists, human rights researchers and other independent observers. If all is well in Papua, as the government claims, why do the Indonesian police and military require a surat jalan, or “walking permit,” for any foreigner visiting Papua? Since the 1970s, political tensions and abuses by the Indonesian security forces have helped create a climate of fear in Papua. This continues to the present. Impunity remains a huge problem. For example, in November 2001, the Indonesian Army’s Special Forces (Kopassus) kidnapped and killed Papuan leader Theys Eluay in Jayapura. The then-commander of Kopassus in Papua, Lt. Col. Hartomo, denied involvement in the murder. But international outrage prompted the Indonesian Military Police to investigate. In 2003, a court in Surabaya found seven Kopassus soldiers and officers, including Lt. Col. Hartomo, guilty of mistreatment and battery leading to Eluay’s death, but crucially not of murder. Sentences served by the seven ranged from two to three and a half years. But Hartomo was not discharged from the Army. Instead, he is now Col. Hartomo, the head of Kopassus Group 1 in Serang, just a three-hour drive from Jakarta. More than 130 people are currently imprisoned throughout Indonesia for peaceful expression, particularly in Papua and the Moluccas. 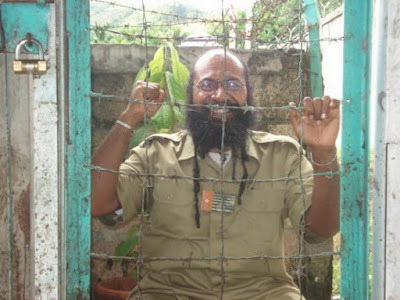 Some have been sentenced to lengthy prison terms, including Papuan activist Filep Karma, who is serving a 15-year sentence for raising the Papuan Morning Star flag in December 2004 in Jayapura. School teacher Johan Teterisa is serving 15 years for raising the Southern Moluccas Republic flag in June 2007 in Ambon. For decades, the Indonesian authorities have treated the raising of the Morning Star and Southern Moluccas Republic flags as a crime because they are pro-independence symbols. Article 6 of Government Regulation No. 77/2007 prohibits the display of the Morning Star flag in Papua, as well as the South Maluku Republic flag in Ambon, and the Crescent Moon flag in Aceh. But these prosecutions and the laws violate internationally protected rights to freedom of expression and peaceful assembly codified in the International Covenant on Civil and Political Rights, which Indonesia ratified in 2006. As one who knows Indonesia, the long history of conflict in Papua, which impacted his stepfather, and how important basic freedoms are to the struggle of a minority for equality and access to political power, President Obama is the right man at the right time to ask the Indonesian government to release all prisoners who have peacefully exercised their rights to freedom of expression and assembly and to repeal laws that criminalize speech. He can explain how tolerance of dissent is fundamental to a democracy. If Obama doesn’t act on Papua, perhaps it will be because young Obama grew up in Jakarta, not in Papua. If he had, he would likely see the Papuan question from the point of view of the “weak man,” of a victim. But if Obama does act, maybe then in Indonesia there will be a recognition that a strong man is one who assists the weak. Andreas Harsono is an Indonesia consultant for Human Rights Watch. tulisan yang baik. saya Yusran Darmawan, yang pernah bung andreas wawancarai. Terima kasih untuk komentarnya. Kalau ada perkembangan dari hasil interview tsb. tolong kirim kabar ya. thanx bung untuk tulisannya, bisa tambah2 diskusi saya di tutorial saya 2 minggu lagi tentang isu Papua, kebetulan saya besar di Papua, dan ingin melihat langkah Obama bulan ini di Jakarta. artikel yang menarik sekali. apakah Obama akan benar-benar tertarik untuk merambah Papua?